What Is an RVT File? An RVT File Open in Autodesk Viewer. A file with the .RVT file extension is a Revit Project file used by Autodesk’s Revit BIM (Building Information Modeling) program. Inside an RVT file is all the architectural details related to the design, such as a 3D model, elevation details, floor plans, and project settings. RVT is also an acronym for technology terms like remote video terminal, route verification test, and requirements verification and testing. However, none of those terms have anything to do with RVT files. The Revit program from Autodesk is used to create RVT files, so it can open files in this format, too. If you don't already have Revit and you're not planning on buying it, you can still open the RVT file for free with the Revit trial. Autodesk’s AutoCAD Architecture, included with AutoCAD, is another way to open an RVT file. AutoCAD, like Revit, is not free software but you use it free for 30 days if you download the trial. If you’d rather not go the traditional route of installing an RVT viewer to your computer, you can view the RVT file online instead. Autodesk Viewer lets you open the RVT file without having Revit or AutoCAD on your computer. The same viewer supports similar formats as well, like DWG, STEP, etc., and makes sharing the RVT file easy. 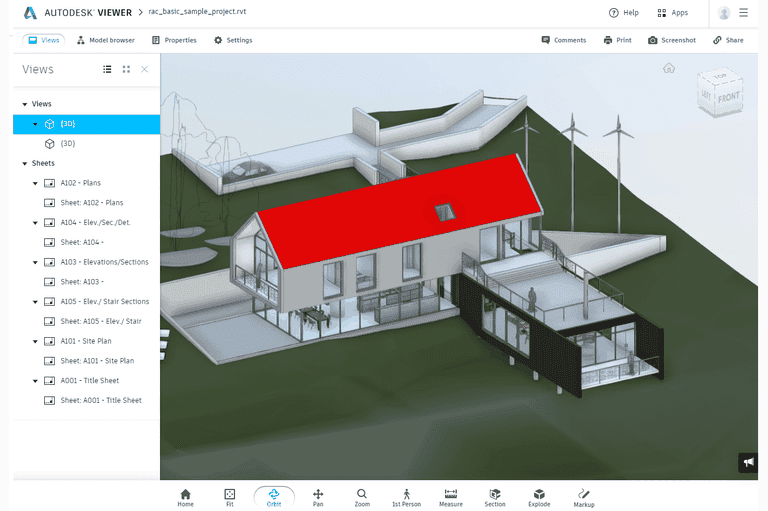 To use Autodesk Viewer as a free RVT viewer, click Sign up for free on the top of the website to make your free user account, and then upload the RVT file from the Design Views page. Revit lets you convert RVT to DWG or DXF via Export > CAD Formats. The program can also save RVT files to the DWF format. Navisworks is one way to convert RVT to NWD. If you have that program, you can save the Revit file to the Navisworks file format and then open the NWD file with their free Navisworks Freedom tool. To convert RVT to IFC, you might have luck with the online Revit to IFC converter tool. However, this might not be a great option if your file is really large since you have to both upload the RVT file to that website and then download the converted IFC file when it's done. An RVT to PDF conversion is also possible if you use a PDF printer. Open the RVT file in any program that supports the format and will let you print the model, and then when you go to print, choose the PDF printer instead of your real printer. Your RVT file can also be converted to the Revit Family file format. To turn your RVT file into an RFA file, first export the model to a SAF file. Then, make a new RFA file and import that SAT file into it. Go to Revit’s Export > Options > Export Setups DWG/DXF menu. Select ACIS solids from the Solids tab, and then click OK.
Go to Export > CAD Formats > DWG. Now you can import the file into SketchUp and use SketchUp’s options to convert the file to any format supported by that software. Still Can’t Open the File? The most likely reason for why your file won’t open with Revit or the other programs mentioned above is because you’re misreading the file extension. It’s really easy to confuse another format with Revit Project file because some file extensions look an awful lot alike even when they’re not at all related. For example, at first glance, RVG files look like RVT files. In reality, they’re x-ray images taken by dental imaging sensors. You can open one not with an Autodesk program but instead the Aeskulap DICOM viewer. RVL is another example of a suffix that closely resembles RVT. You need muvee Reveal to open one of these movie project files. If your file does end in RVT but it has nothing to do with Revit, open it with Notepad++ or another text editor. It’s possible that your file is just a plain text file that can be read easily with any text file viewer. If not, you might find some sort of descriptive information within the text that can help you figure out what format it’s in, which you can then use to narrow down your research in finding a compatible program that will open it.